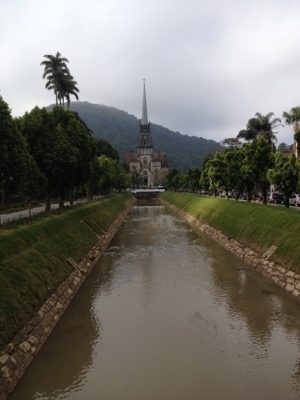 On Friday, we decided we would take a day to travel north of Rio to the Imperial town of Petropolis, not just because it was the town responsible for brewing one of Rio de Janeiro’s cheapest beers, but also because it is formally the summer capital of Brazil and prior to this, the summer seat of the Brazilian Imperial Family. The bus from Rio finally brought to me my long envisaged ideal of traveling around South America, steep mountain roads with hairpin bends and lush (Atlantic) rainforest dotted with low lying clouds. This culminated with the sight of a petrol tanker, whose driver had clearly misjudged the bend, hanging half on, half off the road. The driver looking on helplessly from the opposite side of the road! Petropolis itself sadly didn’t hold the wonders of South American travel that the drive had promised and it was hard to feel even remotely like Hiram Bingham or a Spanish or Portuguese conquistador when faced with more remnants if 1960’s brutalist architecture. Sadly, the low lying cloud had evaporated leaving a grotty town in view. There were some beautiful buildings to be found, none more so the Imperial Palace which had been well restored. As we moved around the rooms learning about Brazil’s Imperial past and the lifestyle they gave themselves. There was an air of the surreal as everybody in the Palace was wearing specially designed slippers to conserve the flooring. The sight of a museum full of people sliding around like ducks ice skating was enough to cheer anyone’s heart and made the trip worthwhile on its own. After the Palace we wondered along a canal that at one stage must have made a gracefully walkway but now served as an open sewer, to the city’s cathedral, again a testimony to the town’s opulent and imperial past. All in all it was a mixed day. If I could get that drive on the way to Buckingham Palace and be guaranteed a sight of the Royal Family sliding around on slippers the I probably wouldn’t bother with Petropolis, but as things stand, it was a nice day trip.